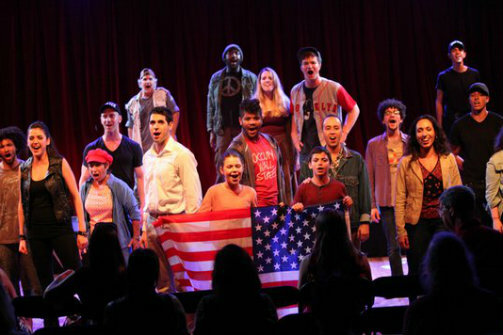 The cast of Zuccotti Park: A Musical About The Human Side of Economics. Photo by Victoria Medina. BOTTOM LINE: Highlighting the individual stories of Occupy protestors, Zuccotti Park asks us to question the American Dream and our role as citizens. As the Flamboyan Theater echoes with Giancarlo de Trizio’s plastic-tub percussion, and dancing, chanting performers beckon us onstage, we feel as though we’ve become part of a lively protest. The demonstration culminates with the ensemble lifting the venue manager into the air, then depositing her center stage for the curtain speech. Zuccotti Park: A Musical About The Human Side of Economics maintains this inclusive energy throughout, reminding us of our role in America’s socioeconomic climate and our responsibility to make a difference. True to its subtitle, Zuccotti Park focuses on the human narratives behind 2011’s Occupy Wall Street movement, giving us insight into the individual activists and their reasons for leaving homes, families, and jobs to protest economic inequality. Set in October 2011, the musical follows Billy Cooper (Ryan Neal Green), a young soldier fresh from eight years’ service in Afghanistan. On leave in New York, Cooper seeks out his high-school sweetheart Kate (Chelsea Rose Amoroso), only to find her camped out in Zuccotti Park with the Occupy protesters. Though he cannot grasp her mistrust of the ideals for which he fought, Cooper’s devotion to Kate sweeps him into the movement and the lives of its participants. By turns, we learn the stories behind the protest signs: factory workers downsized after twenty years’ employment; cancer patients denied affordable care; senior citizens bankrupt from inflation. Misled by shady real estate brokers when buying their first home, young couple Maria and Joe (Daria DeGaetano and Michael J. Verre) now struggle to pay their mortgage and provide for their son Juan (Matthew Martinez). Unable to find work or suitable PTSD treatment, veteran Tom (LaRon Hudson) has just lost custody of his daughter (Jessica Cherniak). Even Kate, top of her class and full of ambition, cannot find the means to pay off her crippling student debt. Struck by these tales, Cooper must navigate this unfamiliar America and re-define his relationship to the woman and country he loves. While the musical tries to clarify some of the issues in which Occupy took root, often via satirical song-and-dance numbers, it is through these personal tales that Zuccotti Park truly shines. Its multi-racial, multi-generational cast displays how economic imbalance strikes every aspect of society, and transcends the boundaries we create. More notably, the show does not favor one political agenda: songs such as the poignant “Hero” or the visceral “This Is War” give equal weight to the sacrifices of picket line and front line. Even the lampooned 1% receive touches of empathy, evident in a stressed CEO’s solo or a wealthy child’s confusion over how money works. Fittingly, the musical ends with a call to action. As performers pass out leaflets printed with the Bill of Rights, we are challenged to revisit our nation’s principles, address its flaws, and contemplate our role in redefining the American Dream. In this divisive election year, Zuccotti Park’s message bears repeating: regardless of our beliefs, we are the 99%. Zuccotti Park: A Musical About the Human Side of Economics has Book and Lyrics by Catherine Hurd; Music & Additional Lyrics by Vatrena King. Directed & Choreographed by Luis Salgado. Musical Director/Piano by Rachel Dean; Drums/Percussion by Giancarlo de Trizio. Lighting Design by Herrick Goldman. Scenic Consultant is Kate Rance. Costume Consultant is Harry Nadal. Production Supervisor is Heather Hogan. Assistant Director is Valeria Cossu. Production Stage Manager is Benjamin Hawkins. The cast is Kris Watkins, Chelsea Rose Amoroso, Ryan Neal Green, Alex Grayson, LaRon Hudson, Wendy Lazarus, Dana Scurlock, Kevin D. O’Neil, Daria DeGaetano, Michael J. Verre, Tim Kava, Leanne Brun, Chris Tuck, Jenna Perez, Elizabeth Casper, Jessica Cherniak, Matthew Martinez, Cait Murphy, Alexander Tomas, Joshua Tavares, Brian Fender-Shirley, Paloma Muñoz, Joshua Wanger, Alex Sanders, and Rebecca Mueller.